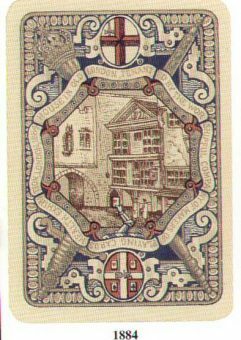 Crossed sword and mace of the City of London. Ace of Spades bears four suitmarks superposed and Goodall & Son. 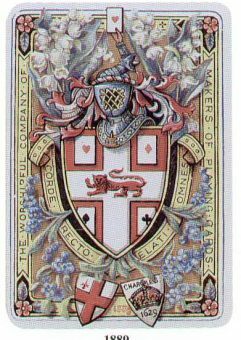 Arms of the Company and the City of London. Hand of Cards. Royal Crown, and the words Jubilee 1887 in celebration of the Golden Jubilee of H.M. Queen Victoria. 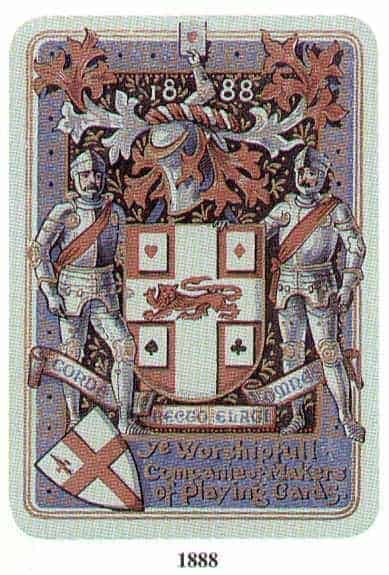 Arms of the Company supported be men in armour and dated. Ace of Spades with portrait of the Master. 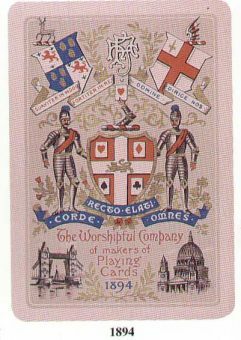 Made be the Worshipful Company, (probably Woolley & Co.). 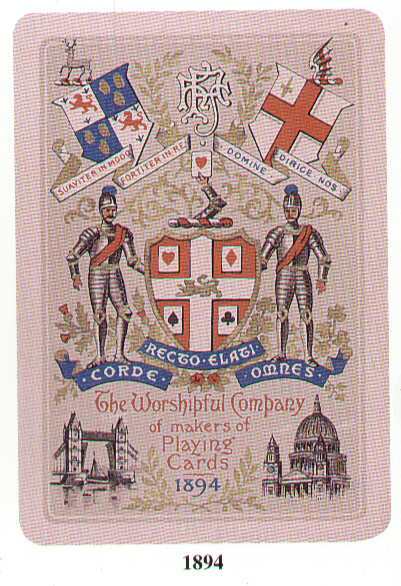 Design by Marcus Ward & Co.
1888 by the Worshipful Company of Makers of Playing Cards. with 52 cards plus the sample cards. 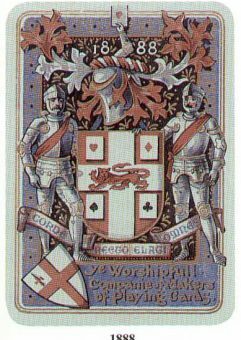 Arms of the Company surrounded with lilies of the valley and forget-me-nots, and dated. 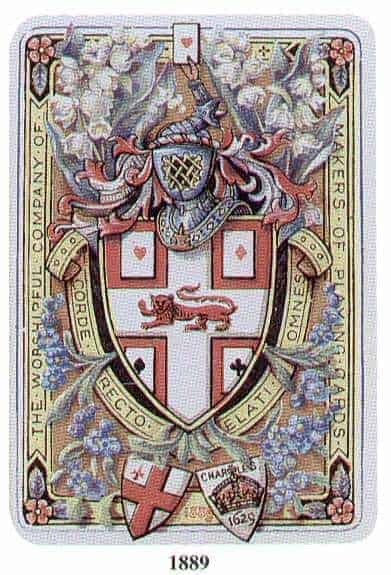 Made by the Worshipful Company, (probably Woolley & Co.). – White background with Ace of Spades with portrait of George Clulow. 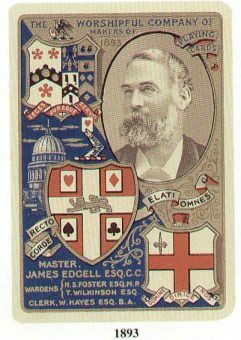 – Blue background with Ace of Spades with portrait of George Clulow as Master of the Worshipful Company. Condition: White in slightly played with condition. Blue in near mint condition. 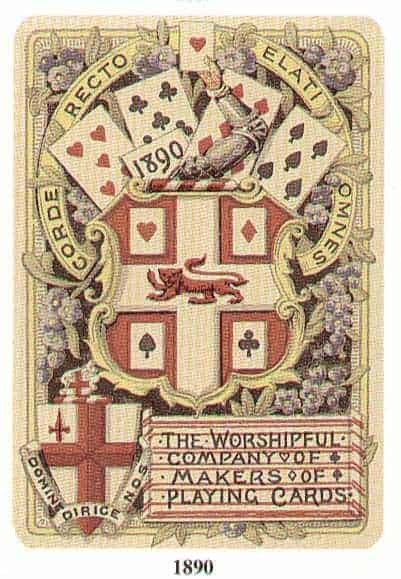 Arms of the Company and the Fives of each suit of cards surrounded with forget-me- nots and dated. Ace of Spades with portrait of the Master. 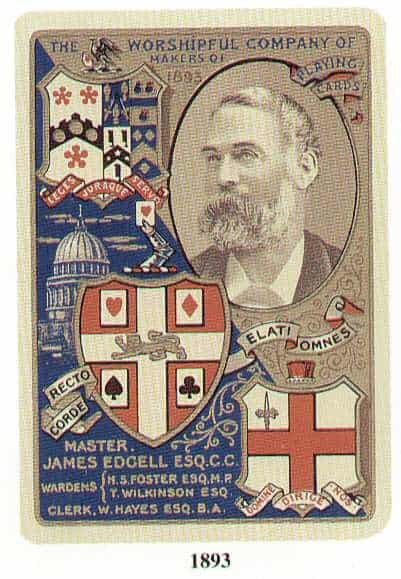 Made by the Worshipful Company, (probably Woolley & Co.). Condition: Pack used for Piquet. 20 cards in very good condition. 32cards in played with condition. with the dome of St. Paul’s Cathedral and the date. The Ace of each suit decorated with a wreath and coloured flowers and the name Chas. Goodall & Son. The court cards represent the Royal costumes of four reigns in English history. Clubs = Plantagenet. Diamonds = Tudor. Hearts = Stuarts. Spades = Hanoverian. Condition: Green in very good condition – Pink in Near Mint Condition. 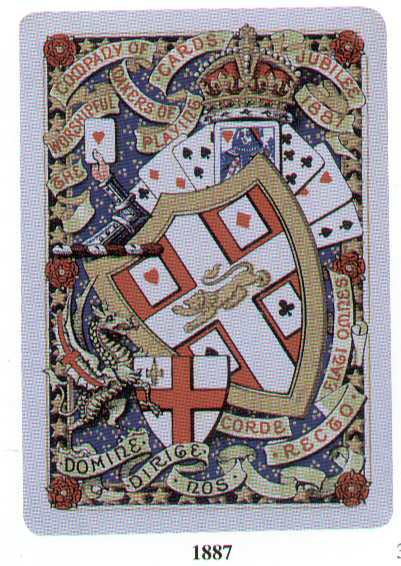 Arms of the Company supported by men in armour and dated. 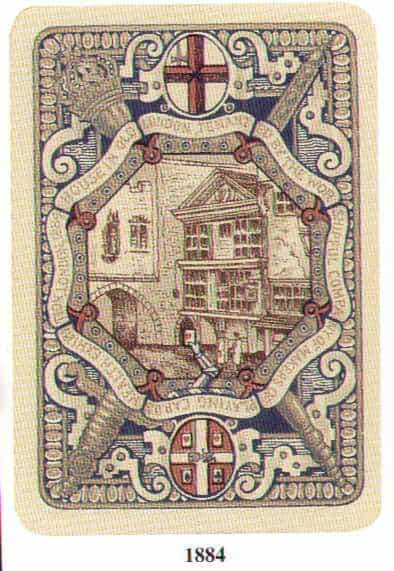 Arms of the City of London and Master above, and Tower Bridge and the dome of St Paul’s cathedral below. Designed and made by Goodall & Son, Ace of Spades with portrait of the Master. 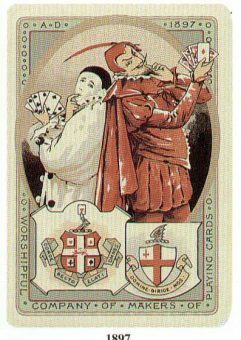 Mephistopheles and Pierrot standing back to back holding hands of cards.